Finding accommodation is a daily lucky dip. Last night in the small town of Finkenheerd we stayed in a kind of cubby house, a little wooden cottage squeezed in between the road and the back of a house. It was clean and comfortable. We had to be satisfied with a cold plate for dinner – and it included excellent smoked fish and potato salad so all was ok.
Finkenheerd has had a major downturn in industry and population over recent decades. It used to have a huge power station and factories, now all gone. At breakfast we spoke with fellow cyclists, a retired Austrian couple and their friend, a German industrialist, who likes to visit the former East Germany to see the effects of socialism and capitalism. He is, of course, very keen on the latter. Frankfurt an der Oder was a short distance away and we stopped for le pause musical on the garden island near the city centre. Frankfurt was damaged in WW2 and many displaced people came there following the war. It now has a modern centre with both old and new buildings, trams and plenty of interesting sculptures in the squares and parks. For much of the way we rode along the path on top of the Oder flood dike. Villages are sparse in this area. We saw other cyclists travelling in both directions but often had the path to ourselves for long stretches. Two old blokes on recumbents were going south as well as a man on rollerblades. Wildflowers alongside the path are white yarrow, yellow tansy, pink clover, pale blue cornflowers and what looks exactly like Salvation Jane – could that be true? We crossed into Poland to look at the town of Kostrzyn. The remains of the old town can be seen beside the river Warta – just the building foundations and narrow paved streets. The new town has a lovely park – and more charming sculptures. Back on the bicycle route we stopped at a kiosk for a reviving beer and bockwurst with onion and pickles. That powered us up for the final 20km. We have now left the Oder and are following Euroroute R1 which will take us to Berlin. We are in the small town of Letschin in the state of Brandenburg. There are memorials here to Russian soldiers who died in 1945. The church was destroyed then too except for the red brick steeple that remains. 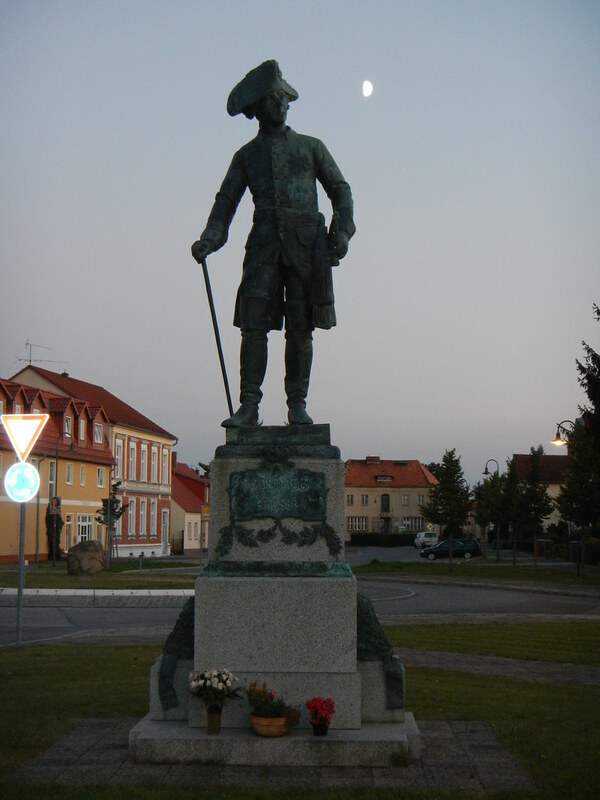 Frederick the Great stands in an arrogant pose overlooking the main street. This entry was posted on 3 September 2014 at 4:24 pm and is filed under Europe 2014. You can follow any responses to this entry through the RSS 2.0 feed. You can leave a response, or trackback from your own site. We try to stay in at least one cubby on every trip.